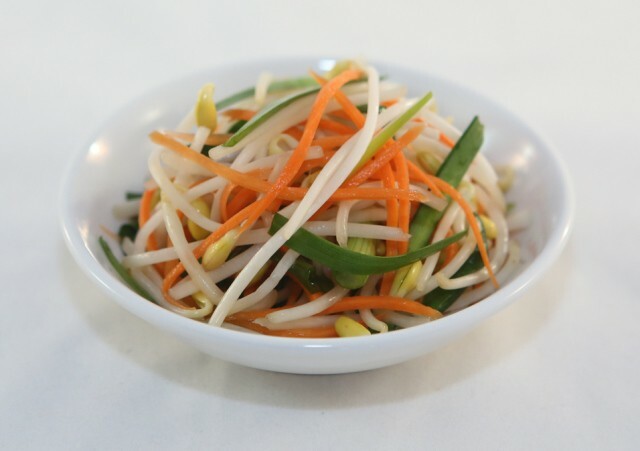 Here’s a delicious pickled vegetables recipe made with bean sprouts, carrots, green scallions and chives. Not as tart as most pickles, they are satisfyingly crunchy and quite refreshing. Serve these pickled beans sprouts as an appetizer or as a side dish with your favorite savory dishes. These pickles are often the companion dish for Braised Pork and Eggs. 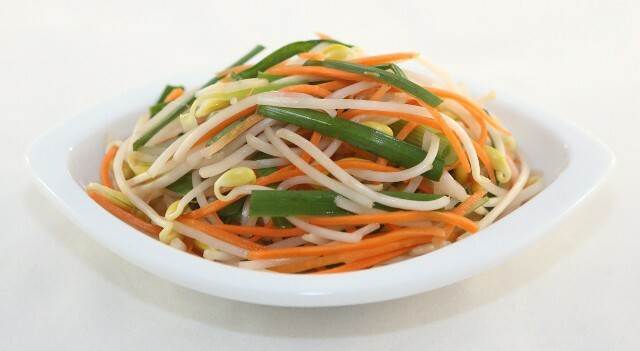 Pluck bean sprouts and remove any wilted and soft parts. Peel and julienne the carrot. Cut green scallions into 3-inch long strips. For the scallion bottoms (white portion), cut in half lengthwise. Wash and trim chives. Cut into 3-inch long lengths. Combine sprouts, carrots, scallions and chives in a large bowl. In a medium saucepan, combine water, vinegar, salt and sugar and bring to a gentle boil. Remove from heat and allow liquid to cool to room temperature. Wash pickling jars and shake off excess water. Microwave jars on high for approximately 1-2 minutes to sanitize and dry them further. Evenly distribute veggie mix between the 2 jars. Pour in the pickling liquid. The liquid will not cover the veggies completely. In a day, the liquid level will increase so we don’t want to fill the jars to the top. Cover and allow to pickle for 1 day. Enjoy these pickles the following day. Refrigerate any remaining portions. Consume within the week.